20. Batrachium S.F. Gray, Natur. Arr. Brit. P1. 2:270. 1821. B.C. Dumortier in Bull. Soc. Bet. Belg. 2:207-219. 1863, W.P. Hiern in J. Bot. 9:43-49, 65-72, 97-101.1871, V.L. Krechetovich in Komarov, Fl. URSS. 7:335-350. 1937, C.D.K. Cooke, Mitt. Bot. Staatssamml. Munchen VI/2: 47-247. 1966. Aquatic plants with floating stems. Leaves either exclusively submerged, multipartite with filiform segments or partly submerged with filiform segments partly floating, lobate to slightly dissected into wider segments. Flowers small, solitary on long peduncles (reflexed in fruit), white with a yellowish claw or yellowish as a whole, with sepals and petaloid petals. Petals with a basal, open nectar pit. Stamens numerous. Carpels nut-l ike, arranged in a subglobose to elongate head, without a keeled margin, transverse-rugose. About 30 species in the Northern and Southern temperate region. Represented in Pakistan by 2 species. 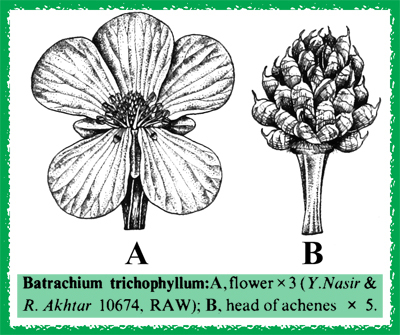 Often included in Ranunculus as a subgenus, but the shape of the nectar-pit alongwith the very specific ecology and its morphological features seem to justify generic separation. In order to identify specimens correctly it is essential that flowering material is collected alongwith the mature or nearly mature fruits. Leaves tend to collapse as soon as they are removed from water and it is necessary to arrange them in a way that shows the original position of the filiform segments. The small petals often get lost, but should be preserved for identification.